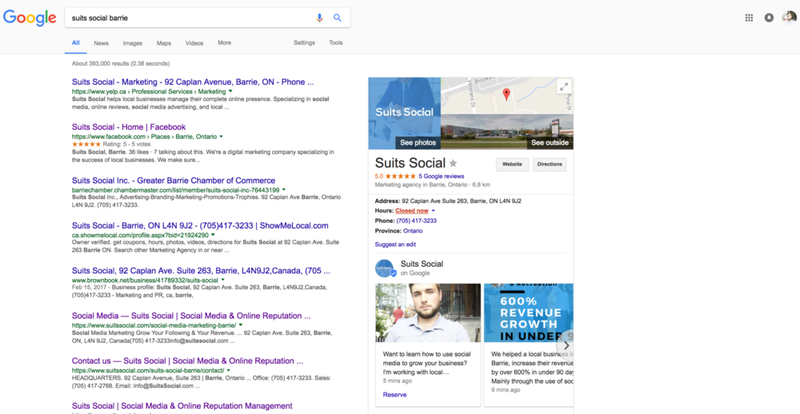 Google Posts for "Google My Business"
Everything you need to know about Google Posts for Google My Business. These Google Posts are searchable, and appear right in the search window when people Google your business. This is a really good thing, because before customers even reach your website, you have the chance to make an impression. Entice them with a deal, special offering, event, or perhaps a case study if you're are B2B agency like we are. The new Google posts are super visual, and do a great job of grabbing your attention. You can even add event details and a reserve, buy it now, or other call to action button. This new feature is a great addition to an already strong social media marketing strategy and should be used along side current content marketing and social media efforts. Suits Social will be rolling out the management of these posts as part of our local social marketing packages, and all existing clients with a reputation management subscription will be provided the service free of charge. What are the benefits of using Google Posts? - Easily Promote Events, Sales, Limited Time Offers, etc. Step 1 - Login to your Google my business account. You can do that HERE. Step 2 - You'll see a new tab for "Posts" in both the sidebar, and in the main dashboard. Click "create a post" to get started creating your first Google Post. Step 3 - Here you'll see any posts you've done in the past, but of course since you're just getting started this will be blank. So click on the camera icon to add a picture and start creating your post. I had already created two Google posts for the purpose of this demo. Step 4 - Set an interesting thumbnail image, this is what people will see on your google listing on top of the post. Here I choose to go with a picture of myself enjoying a classic old-fashion in Yorkville. But enough about me. Set you picture and move on to the next step! Fill out the body text for the post with something short and sweet. You have between 100-300 words, so don't write a novel, but don't use a one liner either. Your content should start with an eye catching opener that stands out to potential customers, and follow that will a description that's straight to the point, no filler. Step 5 - After finishing up with writing the post, you can choose from two additional options. Besides an image and text, you can also choose to label this as an event, and/or add a call to action button. Labeling this as an event will allow you to set an event title as well as a start date/time and end date/time. For the call to action button, you can set whatever suits the post, you can choose anything from a learn more button, to a reserve now button. For more information about "Google my business", improving your local search rankings, getting more reviews, or using social media to grow your business, get in touch for a personal 30 minute consultation. I'm happy to learn more about your business, answer any questions you might have, and get you pointed int he right direction. Thanks for reading! This One Mistake Is Costing Dealerships Across Canada Millions! Dealerships are at risk of going the way of Kodak. By clinging to the traditional way of doing business, they're missing out on huge opportunity and practically inviting startups to come in and disrupt their space. In particular i'm speaking in regards to the way they reach out, attract, and engage with new customers. As of 2017, 90% of purchase decisions are now made online, failing to create a powerful presence in this space will have dire consequences. In the short term, this will result in countless customers and deals lost. In the long term, it will result in the downfall of the dealership as we know it, as startups work to bring high-tech into the world of automotive sales. Online presence is a broad term so lets narrow it down. The quantity and quality of your online reviews, social media profiles, and business listings all play a role in how customers find your dealership online. These key factors also play a role in helping customers decide how they feel about your business. As in, do they trust you and are they willing to spend their money with you? So you might be asking... how are dealerships loosing millions of dollars each year? Recent studies show that businesses with a positive online presence generate between 5 - 9% each year. Now every dealership is different, but lets just assume your dealership generates about 2 million per year in gross revenue. A 5 - 9% increase would equate to roughly between 100,000 - $200,000 dollars a year. Multiply that by the number of dealerships in Canada with a weak online presence , and I promise you the number will be in the hundreds of millions if not billions. That is quite an opportunity. How your dealership can capture a slice of that million dollar pie! First and foremost make sure your dealership comes up on google with an accurate location page, relevant pictures, and most importantly positive reviews. Google reviews are king! Not Reviewsii, or any other self contained review platform. Google reviews will boost your rank in search by as much as 25%! They are also the most trusted and most frequented review score visited by consumers. The next thing you need to do, the thing that 99% of dealerships fail at, is build a powerful and dominating social media presence. A strong social media strategy across as many relevant platforms as possible will be crucial to your online success. It will increase your rank in local search, increase relevancy, validate consume decisions, and increase brand awareness. I could write a book on social media strategy, tools, and hacks, but lets just save that for another day. You know how to reach us for more info. The last and simplest tool to get a slice of that million dollar pie is business listings. Business listings are simply places online that list your business information. If these listings have inconsistent information, or missing information, your relevancy in local search and overall SEO will suffer. Make sure you frequently browse the top 10 Canadian listings sites, and check for correct business data. Want to turn your dealership into a digital powerhouse? Darren Cabral, Founder of Suits Social shares the most important secrets of building a great online reputation for your business.